Greg’s love of the outdoors began when he was a toddler. His father began taking him fishing and hunting as soon as he could walk. 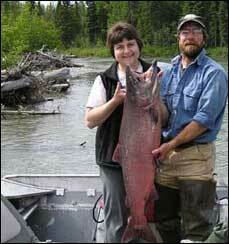 He has lived in Alaska since 1985 and has been guiding hunters and Alaska salmon anglers for over 23 years. When not fishing for Alaska’s salmon or guiding big game hunters, he is spending time with his family or working as a carpenter. When you book your Alaska fishing trip with Acord Guide Service, Greg will be your guide. 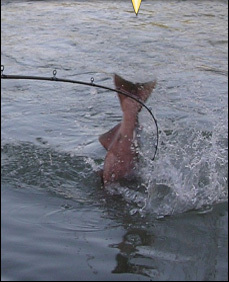 He is licensed by the United States Coast Guard and the Department of Fish and Game. He also is fully insured and first aid certified. His guarantee to each angler is to do everything possible, within the confines of the law, to make your Alaska salmon fishing trip successful. Acord Guide Service is a family owned and operated business. 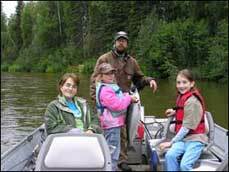 Greg, his wife Annemarie, and their three daughters are long time Alaskan residents. 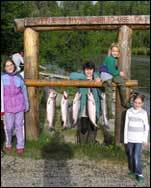 Their goal is to offer the highest quality Alaska Salmon fishing experience near Anchorage and Wasilla. 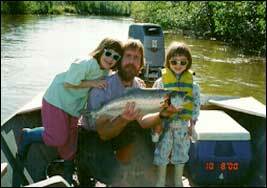 The Acord family lives, works, and plays in the woods and rivers of this great state and is dedicated to providing fun and safe guided salmon fishing adventures. Copyright 2010 © Acord Guide Service.